Before shipment, each Pitch Adjusted propeller is double inspected for correct balance and pitch setting. The pitch of each Jensen Pitch Adjusted propeller is carefully calculated, then precision set by this unique assembly machine. 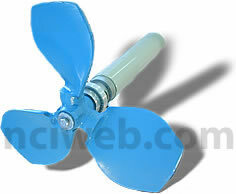 Jensen Pitch Adjusted propellers can easily be installed through most standard manways without removing the prop from the mixer shaft or entering the tank. See Larger Image of Propeller.